Getting a shot in the groin is often met with laughs from everyone around you. Whether that is in boxing, football or cricket, the recipient is often left on the ground while the others around them find the whole episode rather amusing. In a boxing ring though, leaving a fighter on the floor through a low blow a serious offence and one which will get them I trouble with the referee. The low blow is off limits and a fighter throwing shots there could be warned, have a point’s deduction or even be disqualified. Despite the laughs that can be had, it is heavily frowned upon and there are many times across sports when sportsman has been taken to hospital due to the damage. If you ever didn’t want to face a fighter it was Andrew Golota, as the man was notorious for giving away fouls as Riddick Bowe brutally found out in 1996. In July of that year the Polish fighter repeatedly caught Bowe below the waist before a full shot on the groin took him down and the fight was ended via disqualification. They rematched again in December of that year and Golota threw a perfect three-punch combination that took Bowe down. It just so happened though that the perfect three punch combination landed on Bowe’s groin and unsurprisingly he went down and once again Golota lost the fight by disqualification. It was an example of where the referee will only accept fouls until a point before a fighter gets disqualified. Perhaps the funniest example of a low blow was in the Ricky Hatton vs Kosta Tszyu fight where Hatton had been of the receiving end of a low blow for which Tszyu got a warning for. Hatton must have thought that it was intentional as he came out from his corner and landed a perfect left hook right on Tszyu’s cup and downed the hurt fighter. He was a clear shot of revenge but Hatton went onto win the fight cleaning with his opponent retiring on his stool after the 11th. So what actually is a low blow? A low blow is defined by an unlawful blow that lands below an opponent’s waist. In boxing there are a few places that you can’t punch your opponent. One of them is in the back, another is in the back of the head, the kidneys are off limits and anywhere below the belt. These will all be given as a foul by the referee who will take incrementally larger punishments if the foul is repeated or if he thinks it was deliberate. The definition of low blows is very clear and doesn’t offer itself up to much interpretation so it should always be easy for the referee to spot and take the appropriate action. Taking shots on your thighs isn’t going to hurt you very much but the referee still needs to know that it was an illegal shot. You can see how seriously a referee takes a low blow due to the seriousness of the penalties that can be put in place and the time given to a fighter who has been struck with a low blow. If you’ve been on the receiving end then the referee will allow you a full five minutes to recover from the shot. If you’ve been hit with an illegal shot then obviously you should be allowed adequate recovery time in order to be fully fighting fit once again. Boxers rarely take anything close to the five minutes required as their groin protector will usually save them from any major damage. If the shot does do damage though and the fighter cannot continue then the boxer who delivered the shot will most likely be disqualified and lose the fight. Technically though, if a boxer doesn’t want to continue after the five minutes have elapsed then he would have been seen to have abandon the fight. In that Bowe fight that we mentioned before, the referee stepped in to disqualify Golota immediately after the shots had been taken. It’s up to the discretion of the referee when and if he decides to call an end to the bout. Yes, yes, they’re incredibly painful but if you fancy a bit of eye watering entertainment, take a look at the video below! First things first, you can’t fight differently if you think you’re going to be on the end of a low blow. If you’re facing someone like Golota then the temptation might be there to close your body up and worry about taking a shot on your most sensitive area. What that fight showed though is that with the right protection you’re going to be fine and also the referee will be able to deal with it. The most important factor in protecting yourself then is by the actual protection you’re going to be wearing. If you’re not wearing any protection for your groin area then you’re not going to be able to fight and the referee will send you back to the changing rooms in order to find something that will give you the level of protection that you need. The best way to do that is by wearing a full groin guard which is going to give you the maximum amount of protection so that you can go into a fight with confidence. It’s important to get one of a high enough quality so that you’ll not have to keep adjusting it or worrying about how it’s fitting you. There are other options too such as compression shorts with a built-in cup. These are quicker and easier than a full groin protector but don’t offer the same level of protection. 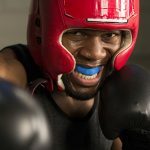 Due to this they are a great item to have if you are sparring but if you are on the receiving end of shots that are coming at you with 100% power then you want to be fully protected. You want to step into that ring not thinking about low blows and not thinking about your groin protector as it needs to stand up to the challenge of taking a heavy shot. If that does happen to you then it’s like being hit when wearing headgear, it’s still going to hurt but it’s not going to do you any serious damage. Referee’s, like boxers, come in a whole range of abilities and there have been times in the past when a referee hasn’t been able to adequately deal with low blows and it has led to a very messy fight which comes increasingly hard to control. If you’re getting hit with low shots then you need to make sure that the referee is seeing them and acting in accordance with the rules. Punches can happen in the blink of an eye and sometimes the referee won’t see everything all the time. You can speak to the referee to watch out for low blows or call it out if it happened. Boxers do this in a variety of different ways but if you point to the area of the low blow or tell the referee, it’s important to obey the number one rule and that is to protect yourself at all times. You don’t want to get distracted by talking to the referee only to suddenly be on the end of a combination. If you’re the one who has delivered the low blow then you are at the referee’s mercy on how you are dealt with. This is almost like if you backchat to a police officer then you are more likely to get a ticket as if you talk back to a referee when he’s more likely to give you harsh punishment. You just need to accept you’ve committed a foul, calmly listen to his instructions and agree with the advice given. If you argue with the decision or ignore what the referee is saying then the next foul you commit could be a point’s deduction or worse. You always have to play the referee in boxing whether that is knowing how long he’ll let a clinch go on, the speed of his count or how seriously he deals with low blows. Q: What should I do if I’ve just received a low blow? A: Contrary to what the usual line of thinking is with boxing, if you’re hurt then you need to go down. This is not giving up or being a coward, it’s making sure that your opponent doesn’t get any advantage from an illegal shot by causing damage when you’re hurt. You’ll often see fighters take a step back, call the low blow out before going down and taking a knee. This relies on the ref seeing the shot but if it was low enough to hurt you then it’s obviously going to be seen. Once you’re down the referee will take the appropriate action and most likely warn the fighter if it’s their first offence and give you enough time to recover. Q: Should I ever throw a low blow on purpose? A: So why would you throw a low blow on purpose? Well it could well be that you want to disrupt your opponent and play dirty, it could be that the referee isn’t spotting them or it could be just for revenge like we saw with Ricky Hatton. Whatever the temptation is, just make sure that you don’t do it as it isn’t worth the risk. We can laugh about Golota now but he had a terrible reputation and an unofficial nickname of ‘the nutcracker’ such was his nature. If you get drawn into that type of fight then you are losing your focus on what your main goal is and you are risking being deducted points or being disqualified from the fight. Make sure that you keep your punches high and win your fight based on your skill and heart and not and underhand tactics. Q: How do you avoid low blows? A: In terms of avoiding taking them, you shouldn’t be worried about that. Fighting defensively to avoid an illegal shot is not the answer and you just need to make sure the referee is aware of what’s going on. If you keep having to take low blows then your opponent is going to be disqualified and you’re going to win the fight. You may be thinking that you’re never going to throw a low blow but the fact is almost all of them aren’t intentional. They are either an attempt at a cheap body shot in the clinch for done through laziness and tiredness. You just need to be more precise with your punches and don’t throw shots without a reason. A low blow is not only a foul but it’d be a waste of your own energy. Knowing the rules of boxing is important as you don’t want to be stuck there in a fight wondering why your opponent is being given so much time to recover from a low blow or not thinking to alert the referee to the fact that you’ve been on the end of some illegal shots. You shouldn’t be getting punched anywhere below the waistline as thankfully that area is off limits to boxers. You want to step into that ring fully confident about what you’re doing and that involves wearing the right amount of protection as well. Once you’ve armed yourself with the right knowledge then you can head out there knowing you’ll be able to fight clean and confidently. Previous articleAre Kidney Shots Legal in Boxing? Next articleHow To Slip Punches Like A Pro!